From his convention speech to last night’s debate, Donald Trump has tried his best to generate fear around crime in America. I still love Republican strategist/skeptic Mike Murphy’s comment after Trump’s Republican convention speech — “Who knew we’re living in Gotham City?” The statistics don’t support what Trump is saying. But the problem is he’s selling a “positive pattern” narrative (meaning a clear pattern, not a positive vibe). The truth, in this case, as is so often the case, is a null narrative of “there is no net increase.” This is a classic example of how null narratives are a tough sell. A SHIFTING BASELINES PROBLEM. If you started tracking the murder rate in 2010 you might accept Trump’s hysteria about crime being out of control. If you set your baseline at 1992 you see it’s dropped in half. But that’s not as good of a story. In “Houston, We Have A Narrative,” I told about the difficulty of propagating null narratives, meaning situations in which there is no clear pattern. This is part of the challenge of establishing innocence in the legal system. People always want a culprit, which is a positive pattern (definitely need to come up with a better term for this than “positive” because everyone is so fixated on the popular definition of that word these days as being happy and uplifting, grrr …).Fighting for innocence is another example of trying to convey a null pattern (we don’t know who did it, but not this person). Our brains are programmed to seek the positive pattern. Trump, having deep narrative intuition, has a good feel for this. He knows how to exploit these programming flaws of the average brain. And that’s what he was doing (again) last night in the debate as he talked about the murder rate. 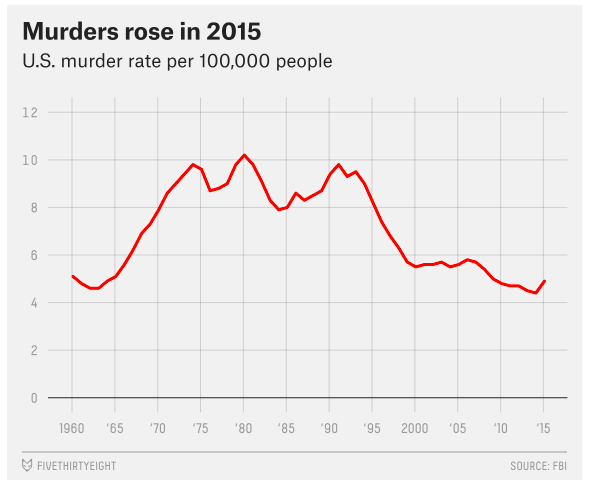 But as the data above from 538 Blog show, the murder rate today is half what it was two decades ago. It’s just that lots of people don’t know this and it’s hard to get them to hear it because … it’s a null pattern. Everybody wants a good story. Declining murder rates isn’t one.